This is a list of establishments featured on the Main Page. You can submit an establishment by following the instructions here: UOGuide:Establishment Submission. 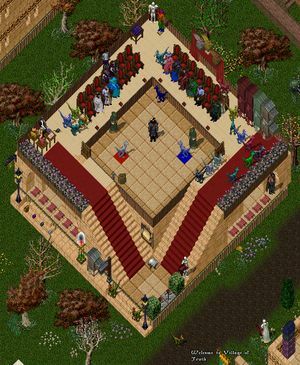 The arena was built by the O*T (Order of Truth) guild, to house the Europa Chicken League fight nights - ECL began with a test match or two in late 2009, opening for the first 'League Season' in January 2010. Seasons run at 12 matches, on Monday evenings 8 PM UK time every second week (the two week gap is to let people have chance to get, hatch, bond and train chicken lizards if they enjoy their first visit!). We try find a fair match for any pets that owners want to fight, so have a reasonable stable of 'house birds' who are not eligible for prizes. The points system is simple, two birds fight and the winner scores one point. Each eligible bird only gets to fight once per evening, so a perfect season score ( which we have never seen!) would be 12 points. Betting on the fight outcomes is run by the house, and the champions get a suitably engraved statue and appropriate prize at the end of the season. As you first walk into the building, you find yourself in the tavern, more often than not staffed by Edwin McCormick. Be sure to say hello. Here you can take a stool and order up a fresh mug of our finest collection of worldly ales, liquors, and brews. We famously house our own private labels --- Pandora's Perfect Pinot Noir (Red Wine) and Lair's Red Mist (Red Wine Spritzer). We also are surely to stock some of the land's best known labels such as Olympus Rum and Aegis Brandy. Some of our lesser known items on the menu hail from a collection crafted by our half-breeds skilled in Mixology... but that's a secret you would never know. Many come on Thursday evenings from far and away places to enjoy their time at the Brew. 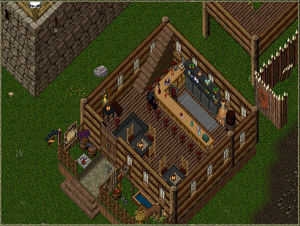 Moonglow Beer Garden, the origin of the Waxing Dark Brew, is built by the legendary IGM Talos. It is used for various festivities where food and drinks were being served by the Moonglow City Council in as late as 2001. It was also an assembly place for the Royal Britannian Guard and for the tournaments held in Valoria and Spiritwood. 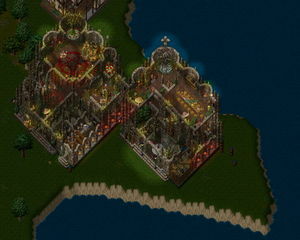 It is destroyed by the Shadowlords in March 28, 2008. The garden is rebuilt to the same location by EM Emile Layne in 2011. The Pax Lair Mage Tower, one of the Twin Towers of PaxLair, is among the oldest and historically richest structures on Chesapeake. 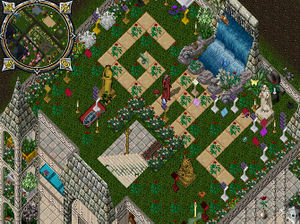 With PaxLair now celebrating 13 years as a player community, the Mage Tower has seen much in its life, including Lord British and Queen Dawn. 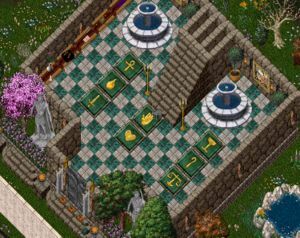 It features many Seer and Interest Game Master (IGM)-placed decorations and usable items which still exist and function today. It's a must-see destination on Chesapeake for those interested in UO history or seeking an active and mature player community. Fun House, Especially built for new players for a bit of challending fun finding their way from room to room via hidden doors and passageways, while searching chests for free stuff along the way. The goal is to make it to the Treasure Room at the end to sift through the best free items. A town of thieves springs up near Minoc on Siege Perilous shard. How could the Britannia Guard allow such a thing to happen? The poor residents of Minoc leave in fear of their belongings. Miners avoid the mines as they will be robbed blind. 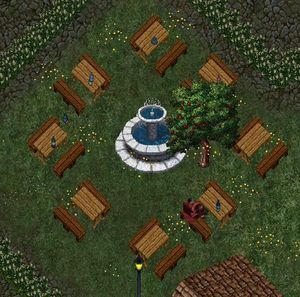 Near the auction house, you will find the Britiannian Alliance Guild Hall, where meetings are held regarding alliance business. Also, you will find a rune library rich in tons of places (Please be aware that the runehouse is still a work in progress). 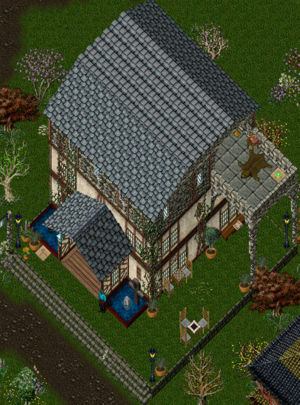 To the south of the auction house, you will find the houses of the great britainnian bank designer, Vladimir. The museum was founded shortly after the Samurai Empire expansion. The collection and rune library were first rate. Unfortunately the museum had a tragic end in January 2006. In December 2007, Hawkeye Pike was washed ashore again in Vesper. After 6 years he had finally returned to Britannia. In March 2008, he decided to try and re-unite the pirates of Catskills once more. Hawkeye reestablished the brethren of pirates to pillage towns, mug landlubbers and conquer the sea. He built the Jolly Roger Inn at a perfect location: The sandy beach of a small lagoon south of Trinsic. Other pirates soon settled in this area, which became the headquarters of the United Pirates guild. 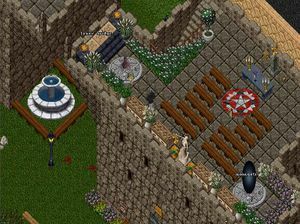 The Grand Britannian Repertory is located just outside of Zento's north eastern gate, and houses over 1,500 books, making it the largest library in Ultima Online history, and the primary center of lore on Atlantic. The library is open for all visitors, and is available for lectures, studies and events. This Rune Library on Atlantic is the legacy of Frank Campbell (aka Lord Goodman) who established his library on the shores of Magincia Beach. The Library continues to evolve and serve the Players of Atlantic. Two new buildings will be opened in the spring of 2008 dedicated to the history & memories of Atlantic. This vendor house / museum has found itself in many different locations on Napa Valley, but it's always been run by Chad Sexington. It was originally established in 1998 as a small marble workshop in the fields of North Minoc.